These optical devices are actually very simple, easy to fix and understand. At their core, they provide 2 streams of data which can be used to decode rotation direction and speed. They all use 2 optical switches placed close together and an encoder wheel. 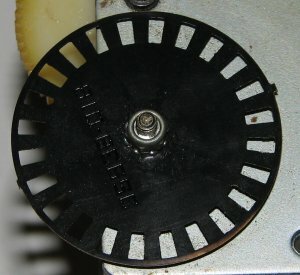 The encoder wheel is nothing more than a thin disk with a series of gaps. Normally, these are spaced at 1/2 the size of the spacing between optical switches. The encoder wheel spins between the 2 optical switches and breaks the light beam causing a series of pulses. 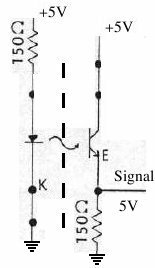 Due to the spacing of the 2 switches, the signals from the 2 switches are offset from each other. By looking at the offset direction, direction of the encoder wheel can be determined. By looking at the offset amount, speed of the encoder wheel can be determined. Now, looking at this simple circuit, one can see two distinct parts: on the left is a simple LED circuit, resulting in the (IR) LED always on. On the right side is the receiver. When the (IR) light from the LED shines on the receiver, the transistor is "on", meaning the signal line is high. When the LED output is blocked, the transistor "turns off", meaning the signal level goes low. The Arkanoid spinner optic board I'm familiar with is marked "J9000024A" and "K9000060A" and has the Taito logo on it. It matches the schematic above. 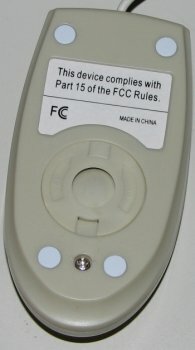 Fairchild QVE11233 - I used these for the 'Intellimouse Hacks (1.1A and 1.2A)'. Have not tried on the original Ark board, but should be fine as the pinout is the same as IS04. 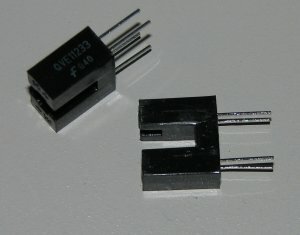 One note on these opto-interrupters: although they look like 1 4-pin device, they are actually a plastic shroud containing an IR LED and IR receiver. In some cases, it might be useful to open the shroud and use the components themselves. 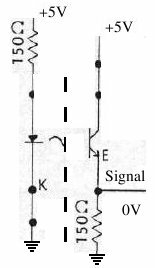 Also note that some of these are labeled E and S. The E is emitter (LED) and S is sensor (receiver). The next step is to connect the left/right wires (pins 1/4) and check again. 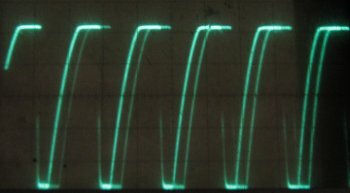 You'll likely see the output voltages drop some from the out-of-circuit measurements, but if you see a substantial drop from 5 (say 2-3V instead of 5), you probably have a weak opto-switch. 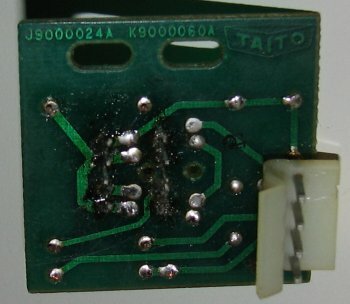 This is probably due to one weak opto-switch on your optic board. With the optic board connected to the game, you'll probably see one of the outputs doesn't drive a very strong signal (maybe 2-3V). You can try switching the left/right signals (pins 1/4). If the spinner no longer works at all, it is one bad opto-switch on the board. Either replace your optos (may as well do both while you're at it), or replace the optic board. The reason for this is how most games decode the optic board signals. Typically, a couple D flip-flops are used and the signals are used as clk and direction. If the signal used for clk is strong enough (but not dir), a valid movement is generated, but always in one direction. If clk is too weak, then no movement is generated. This could be any number of things -- bad optic board, bad logic board, etc. One easy test to try first is to swap the two outputs from the optic board (pins 1/4). If you now get movement from the spinner, but only in one direction, you have one bad opto-switch on the optic board. Either replace your optos or the whole optic board. 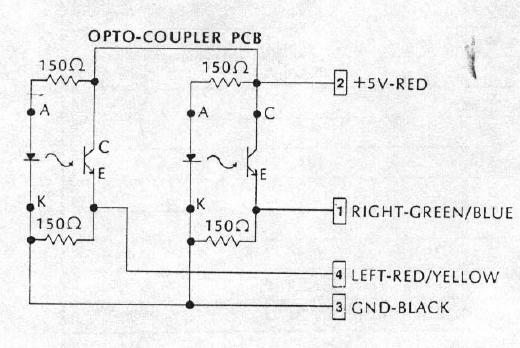 If swapping signals made no difference, verify the voltages on the optic board are as expected. If the output signals look weak, you probably need to replace the optos on the board. Otherwise, try a different logic board to see if the problem resides on the game board. I have not actually worked with one of these, but someone sent me some pictures (thanks Malcolm). Once again, this works the same as every other optic board I've seen (surprise, surprise). NOTE: it appears to me that +5/GND are switched from the Arkanoid/Michael Grugel board. Be sure to check that before hooking it up (not that you'll damage it, but it won't work). Notice that this board mounts the opto switches at a strange angle. This is because of how Atari made their encoder wheels (I'll post a picture eventually). 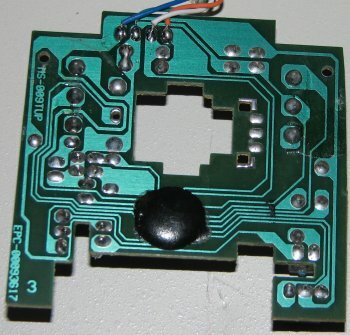 If you need to replace one of these boards, you might want to just buy a new non-Atari encoder wheel and use a more standard (and therefore easily/inexpensively attained) optic board. Also note that the opto switches actually come as 1 big package that contains 2 switches. Inside the plastic shroud is the same as usual opto-interrupters. I don't have the measurement of pin spacing. If you do, feel free to share. The pinout (ignoring spacing) looks the same as H22A1, so 2 of those may be a good replacement. If they don't fit, you could open up the H22A1 and use the two components (IR LED/Receiver) in the original shroud. 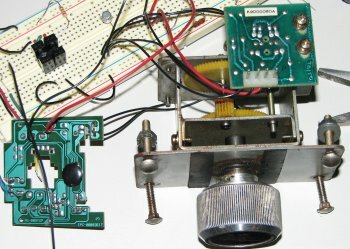 Note: This same optic board (or very similar) is used in (at least some) Atari trackballs. The 4" trackballs (Football/Missle Command/etc) definitely used these. I have tried the boards from Michael Grugel and the Taito originals (and my own home-built copies). Michael's are essentially reproductions of the Arkanoid board. I have been very pleased with the quality and price of the boards. They are also suitable for trackballs, but I haven't tried them in that application (yet). Any of these boards _should_ work with most spinners/trackballs/optical steering wheels. The only considerations are mounting and pinout. Another one I haven't worked on, but have seen pictures of. 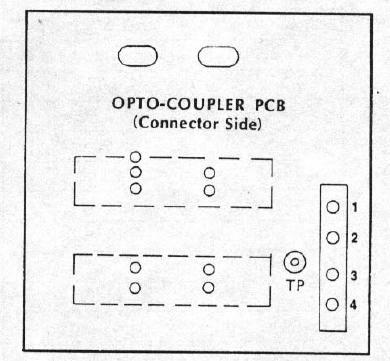 This is actually a somewhat unique design in that the outputs are actually driven using a discrete transistor beyond the opto in the opto-interrupter. This should make them less susceptible to marginal signals from the opto. 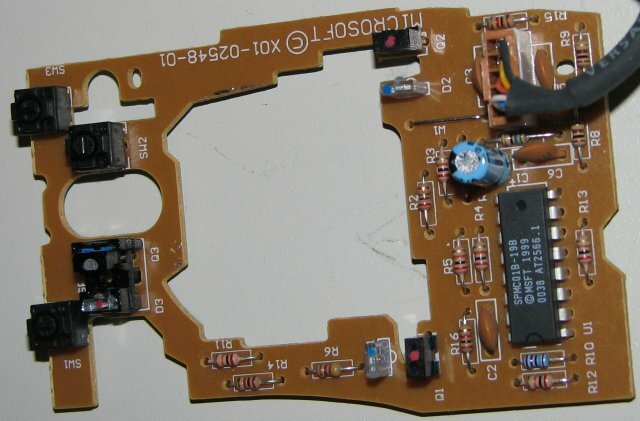 I'm not sure if it was the original part or not, but a NEC PS4001 was found on an old board. Fairchild H22A1 should be a drop-in replacement. This board is fairly different from most other optic boards in that it has built-in contacts on the board and is to slide into a connector as a jamma board does. I'm not aware of any repro boards, so the best bet on these is probably repair. Original opto-interrupter is TIL143. A modern (overpriced) replacement is NTE3100. Another option is TCST2000, but seems to be hard to find. It also looks as if the QVE00118 from Fairchild would work fine. Anyone care to test? Please email me with results if you do. Optical arcade controls such as trackballs, spinners and optical steering wheels (ie Pole Position, Super Sprint, etc) can easily be interfaced to a PC via PS2, USB and serial. The easiest way to achieve this is to use an OptiPac board from Ultimarc. The signal outputs from the optic boards connect to the OptiPac and that connects to the PC via USB or serial. This is the method I'd recommend as it's the cleanest and easiest. Ultimarc has a great lineup of high-quality products and excellent support. 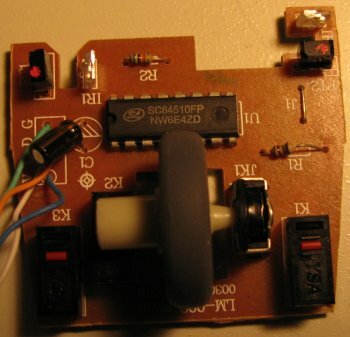 If you are too cheap to buy the OptiPac (it's really pretty inexpensive) or just get satisfaction from building something yourself, you can try converting a computer mouse to a optic board signal to PS2/USB/Serial converter. The interesting portion of the mouse controller is the single IC they all have. These ASICs serve the same purpose as an Optipac. Unfortunately, they are not easily available in hobbyist portions and/or not well documented. The easiest and cheapest way to get these chips is to cannabilize a mouse. However, this means some work determining what is going on for each board since there are many variants of the controllers (and some are simply small microcontrollers). Like their arcade cousins, these boards also use IR LEDs and IR-receivers as optical switches. They also use encoder wheels, though normally quite a bit smaller than the arcade versions. They have also squeezed as much cost out of them as possible, meaning that things have usually been somewhat simplified to save parts cost. Normally there is just 1 IR LED per axis, shared between the 2 receivers for the axis. The receivers have been combined into 1 3-pin device that actually contains 2 IR receivers. 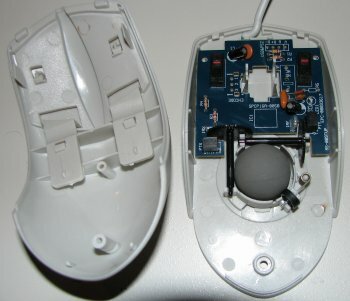 In addition, many mice play tricks with driving the LEDs. Some actually pulse the LEDs at a high rate in order to save power, extend the life of the LEDs, and increase LED output. When the LEDs are being pulsed, they can be driven harder in order to generate a brighter light. Another thing that will be found inside some mice (Logitech is one) is some non-standard parts which I still don't fully understand. These contain a 3-pin IR LED and some contain a 4-pin receiver. When time permits, I will investigate. If someone else already has, please consider sharing what you know. Another way to tackle this problem would be to write a simple program for a small microcontroller. 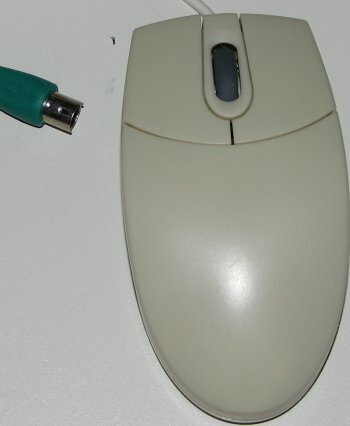 However, this is probably not cost effective since you can usually find old mice for less than $5. In addition, hacking the mouse provides a nice cord/connector. 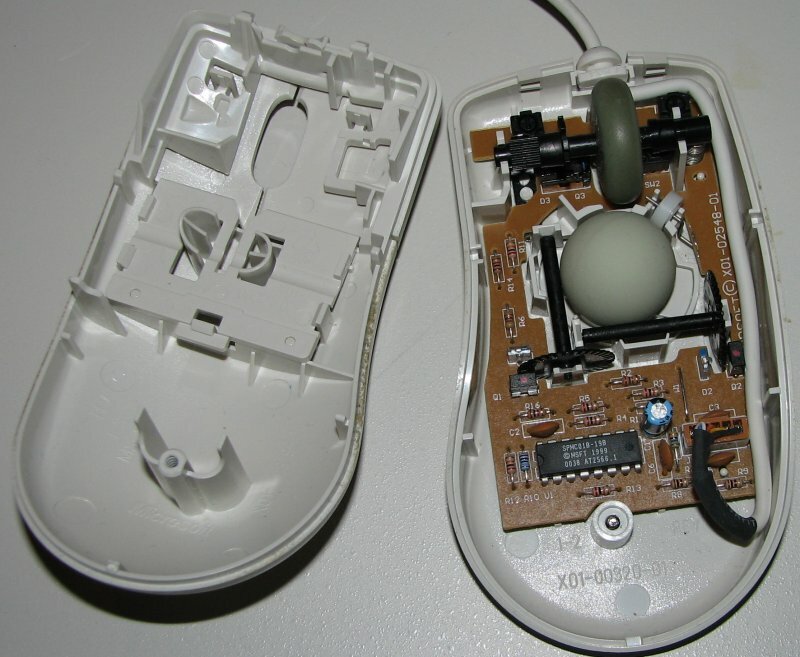 As the old ball mice supply dries up, the microcontroller route may be the way to go. This will require implementing the PC communications side of things (probably USB) as well as the optical signal decoding. This is a perfect mouse for hacking as it's very simple. It doesn't do any modulation of the LED signal, making a conversion to external opto switches very easy. It It uses a Z80 (Z86317) processor running at about 4Mhz for the optical signal to PS2 conversion. Pics and more info coming soon. Interestingly, this uses a pot for the scroll wheel. This might be a good model for attaching an analog steering wheel (pot) (z-axis). This is quite a bit different than the v1.1A mouse. It uses a different processor and also modulates the LED signal (pulsed -- see above). 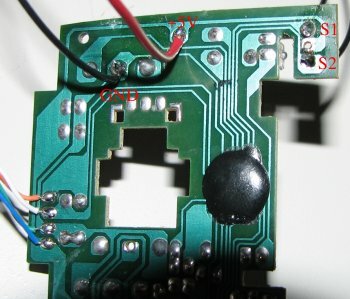 This was suspected after looking at the LED driver circuit -- it connects to a pin on the controller IC. Scoping that line confirmed those suspicions. Fortunately, it appears that the modulation isn't required by the receiver. By tying the IR LEDs always on, this works just dandy. In this model, the scroll wheel also uses an optical encoder, so there are potentially 3 inputs to steal here. This model uses a processor/controller SPMC01B-198 which I know virtually nothing of. If anyone has a data sheet and is willing to share, I'd appreciate it. This looks to be very similar to the v1.1A internally and should be an easy hack. This model has 2 buttons and does not have a scroll wheel. It uses a Z80 processor (Z8631704) but with a different date stamped on it than the v1.1A. This date probably refers to the ROM in the chip, I'm guessing. Since this model doesn't have a scroll wheel, this probably makes sense. I have no idea how the versioning works. Perhaps the major number refers to the product line and minor number is the revision? 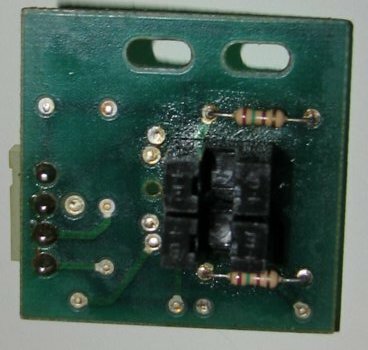 Internally, this model is marked with board 900-336-126 Rev C. An interesting difference with this one is the IR LED/receivers are covered with a black plastic shroud. Apparently there was enough light-leakage into the case (probably between the buttons) that these shrouds were required. Other models have the sensors toward the back of the mouse, so this apparently isn't a problem. I have also seen a mouse marked Microsoft for Toshiba (p/n 92608), also marked 2.1A, which looks to be identical to the Microsoft p/n 63607 (not surprisingly). 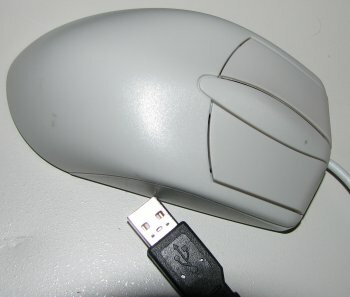 Finally, a cheap (quality and price) mouse with a well-defined mouse controller. 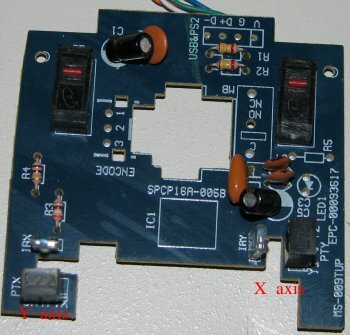 Uses the SC84510FP PS/2 controller. It uses a pot for the scroll wheel, which can probably also be put to good use somewhere. This is a breeze to modify. It's a shame that Compgeeks is almost out, but they can be found other places too. Ok, this one turned out to be as easy and straight-forward as it appeared. There are no tricks here -- just a simple, documented design. In this case, I actually left the IR LED and only removed the IR receiver(s). The center pin of the IR receiver is +5V, as usual. 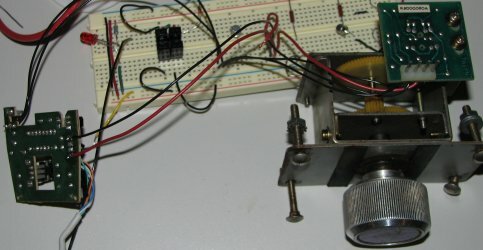 The 2 other pins are the 2 signal outputs. 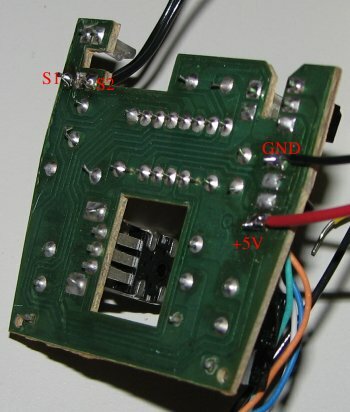 I connected these 2 pins to an Arkanoid encoder board (pins 1/4) and borrowed +5V/Gnd from the connector (nicely labeled on the board) and routed those to pins 2/3 of the Arkanoid optic board. Bingo -- in business. This is a great mouse to use if PS/2 fits your needs, since it is simple and the datasheet is available. In fact, I plan to de-solder the IC itself and mount this on my own custom encoder board. One warning: be careful -- this is cheap both in price and quality and therefore fairly delicate. Both the connector and the gauge of wire used is pretty light. For the modification, I did just one axis (X). I removed the 3-pin IR receiver (and left the IR LED). 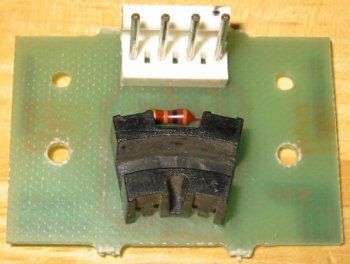 The center hole can be left unused or used for +5V. 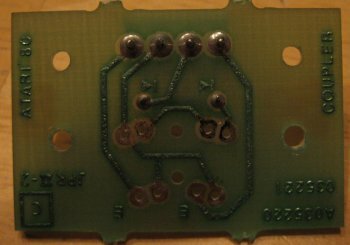 The two outer holes take the signals from the opto-interrupters (or signal pins 1/4 from an Arkanoid optic board). +5V/Gnd can be found various places on the board. I just used the input header pins. 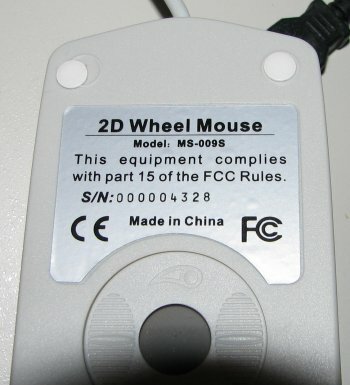 This shows the spinner connected to the mouse and working great. 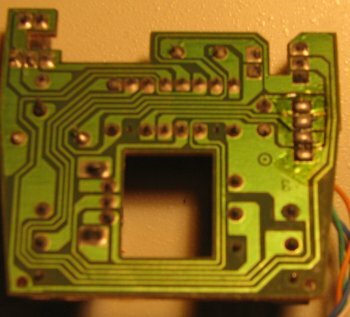 The +5V line from the mouse goes to pin 2 on the optic board, GND goes to pin 3, and the 2 signal lines from the optic board go to the IR receiver outer pins on the mouse board. Ignore the breadboard. I was only using it to easily connect the wires from each board for testing. This one goes so far as to cover the controller in a blob of epoxy. I guess their design must be precious. ;-) It's a little scary when there isn't a company willing to own up to designing these. Made in China -- surprise. However, for $0.99, this should work. This one was fairly interesting. Due to the epoxy blob, it's impossible to see what goes where, but I did scope it. When plugged into a USB hub, I saw +5v but no action - IR LEDs not lit. After connecting a computer to the hub as well, things came to life. The LEDs were being pulsed (at a rate I didn't bother measuring). None-the-less, I decided to press on and see if the modulation was expected on the signal lines. Thankfully, the answer was no. 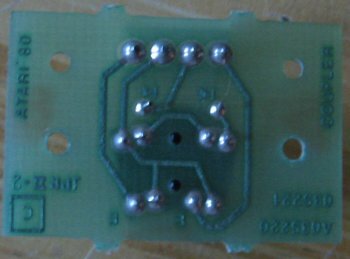 This was a simple as removing the IR receiver, using the center pin for +5V and routing the other 2 pins to the output of my new IR receivers. I stole gnd from elsewhere on the board. I used the +5 to power the emmitter side of the opto switches (through a resistor). That was it -- works great. So, if you want USB, this is probably a great choice. Simple, small and CHEAP. Enjoy. For the modification, I removed the 3-pin IR receiver for the X-axis (repeat for the Y-axis if you need the input). 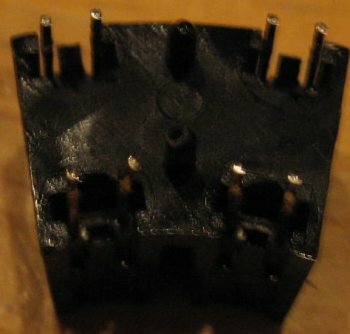 The middle pin can be left unused or used as the +5V source. The two outer pins are the two signals from the opto-switches. Ground and +5V were pulled from elsewhere on the board. Here you can see the whole hookup. In this case, I used the Arkanoid optic board rather than building my own like I normally do. S1/S2 go to pins 1 and 4 on the optic board. +5V goes to pin 2 and GND goes to pin 3. Ignore the breadboard -- in this case I'm just using it to route the wires from the mouse board to optic board. 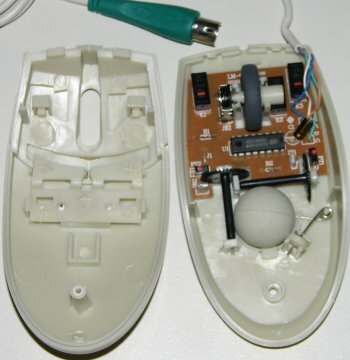 SEE ALSO: Connecting a trackball via a hacked ms009s-blk mouse. Ultimarc: OptiPac - This is really the way to go for interfacing arcade spinners, trackballs, and optical steering wheels to a PC. Much easier and cleaner than the mouse hack.